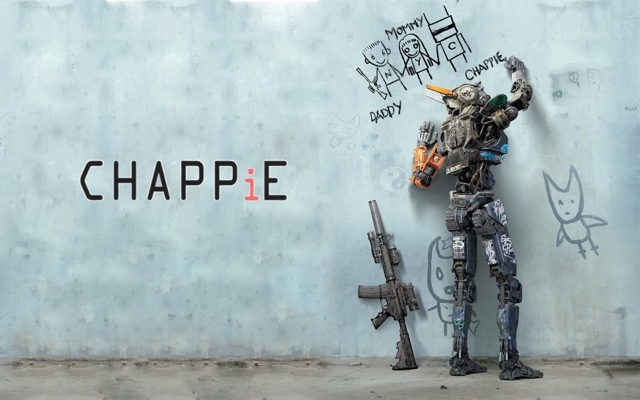 The Third in the trilogy of Neil Bloomkamp's South African Sci-Fi action series,with the excellent District 9, being outstanding, Elysium slightly underwhelming,I had high hopes for this Movie,well it should have been called"Crappy" as it is not good. With Shartlo Copely only the voice of Chappie,this time,but actually acting alongside the real actors whilst filming,to have the CGI added in post production. Why didn't I like this? For one the actors were bloody annoying, One Being called Ninja, and being his real name in real life,to the South Africa pop star Yolandi Visser,once again the same name in real life,were just so awful,and annoying in this,even the Normally reliable Dev Patel could not save this mess of a film. Set in the future,with Johannesburg already being a violent city,with gang violence,murders crime out of control,the Police force are struggling to cope,so the Government out sorts to a private military defence firm,with this breed of law enforcement Robots,to take back the city. Somehow alongside this story,we have the software developer,working on an Artificial Intelligence programming software,to make the Robots more Human. With the idea being scoffed at by the CEO of the company,played brilliantly by Sigourney Weaver. 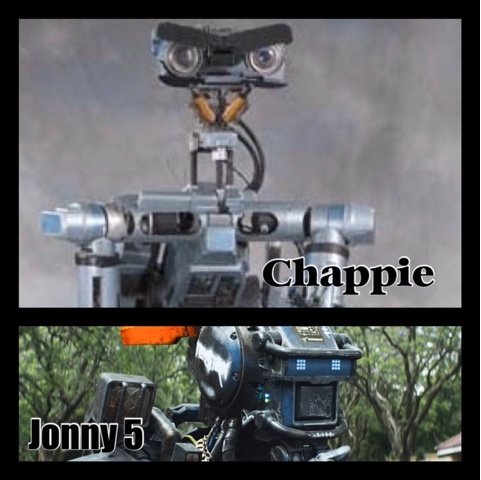 When a Robot is decommissioned,for being battle damaged,the programmer,uploads his new software to him,and smuggling out of the company,to be abducted by this crime gang,who realise Chappie is not a battle Robot now,but like a Child,with none of its original violent tendencies. This is what I found hard to watch,and it was like I had seen before in a 1980's movie Short Circuit,with the similar idea,a battle Robot,believing himself to be human,and Alive. The whole film in a way annoyed me to the bad haircuts,must be a norm, in the future,to Hugh Jackman being the bad guy,who wants his breed of more violent Robots on the streets,that look similar to Ed209 from Robocop. The whole film just seemed too familiar,and I had seen done before,but better. Yes we still have the usual violence we see in Neil Bloomkamp's movies,but the whole Johannesburg setting is becoming annoying now. Yes I get the message now,South Africa is a very violent country, with Poverty also,with very violent cities. But I'm bored with it now, Neil Bloomkamp is a very talented writer and director. With a great eye for action,and Sci-Fi movies,and set pieces. But please try a different setting,or a different country,as the same theme is running between all three movies now. We kinda get the message now. I know you are South African,and proud of your country,but also you want to highlight the floors in it too,but please move on and try something new. Six years since your Debut,and you have made 3 different films,that in a way is very similar to the previous one.with the same message in all three,that you put across better in your first movie.